3 Lone Sand Hill Cranes slowly bank and turn as they glide towards a large field already full with Cranes. 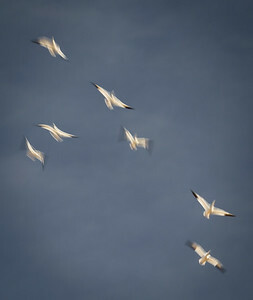 Graceful images of the birds in flight. 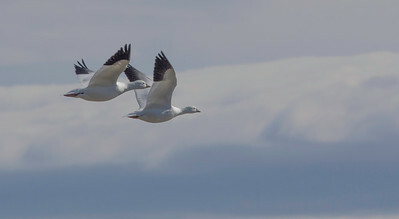 I was able to capture these two flying bye as the rest of the Snow Geese were already on the water. Just like "Fish Balls" in the sea. 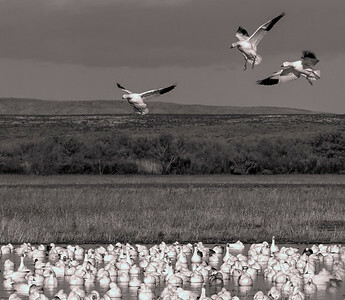 Birds change direction, altitude and shapes as they head toward the south ponds. Truly amazing! On final approach .. gears down, full flaps. The Silhouette was so peaceful to see, with "no" sounds at all. They're about to call an end to the day's activities. Pre Sunrise reveals Snow Geese sharing a field of water with Sand Hill Cranes. Stars, Gloves, Hats, Coats, and a good old friend (D.A.) What a great morning! Smaller groups of birds can give you the best opportunity for photography. November mid-morning. 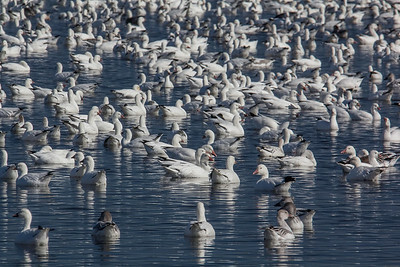 Snow Geese move from the northern refuge, south towards the larger ponds. They're wonderful to see in-flight winging at speeds up to 40 mph. The last few Geese incoming to the overly packed water ponds. This brought about agitated "honking" as a result of the new arrivals. There were several mass ascensions and landings. 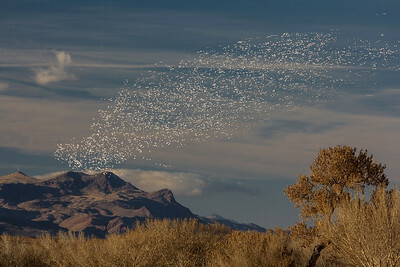 Imagine the sounds of this many birds landing all at the same time. Awesome! These birds were flying low and fast across the marshy landscape. They flew right overhead and never broke formation. To each his own airspace. The skein was flying along in the classical V-shape pattern. 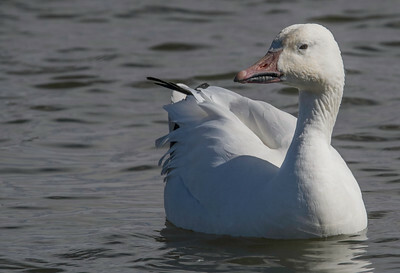 This cropped image shows a small number of White Geese on the water. There were literally thousands of them. This pair stayed close to each other all the way across the field! This particular goose was very calm. It just kept swimming around in a big circle. Waiting on the sun to come up. 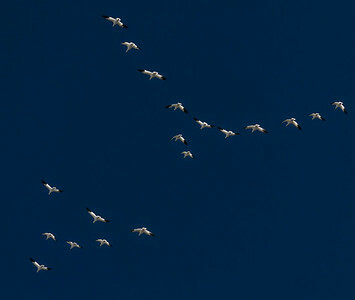 Moments later, the white geese all lifted off together and headed towards the north corn fields.